You are at:Home»Herbs»Allium Sativum Linn. Latin name : Allium sativum Linn. Description : Garlic has been used as both food and medicine in many cultures for six thousand year. The extract of garlic was found to have a significant protective action against a fat induced increase in serum cholesterol and plasma fibrinogen and in fibrinolytic activity. The volatile oil contains allicin, an active odorous principle in Garlic. A study by Silagy and Neil (1994) showed that garlic supplements have an important part to play in the treatment of high cholesterol. Overall, a 12% reduction in total cholesterol was shown over a placebo and that this reduction was normally evident after only 4 weeks treatment and was considered likely to persist for as long as the study was in progress. The largest study so far was conducted in Germany where 261 patients from 30 general practices were given either garlic powder tablets or a placebo. After a 12 week treatment period mean serum cholesterol levels dropped by 12% in the garlic treated group and triglycerides dropped by 17% compared to the placebo group. Counteracts the tendency of clot forming cells to stick together within the blood. Garlic is used as an alterative, antibiotic, aphrodisiac, carminative, expectorant, rejuvenative and stimulant. It also possesses anthelmintic, antiarthritic, antibacterial, antibiotic, anticoagulant, antifungal, antihypertensive antiinflammatory, antimicrobial, antioxidant, antiparasitic, antiseptic, antispasmodic, antiviral, cholagogue, diaphoretic, digestive, disinfectant, diuretic, expectorant, ferbrifuge, hypocholesterolemic, hypoglycemic, hypolipidemic, hypoproteinemic, stimulant and stomachic action. Popularly used as a digestive aid, Garlic increases bile production while enhancing digestion and reducing stomach gases. It is an effective detoxifier as it cleanses blood and lymph. It increases prothrombin time and fibrinolytic action. It is used in dermatophytosis, cough, influenza, febrifuge, in intermittent fever, earache, dyspepsia, flatulence, colic, reduction of mineralization and antifertility. It is also used as a rubefacient, hepatoprotective and antiandrogenic. The platelet and hypolipidemic activities of Garlic ensures smooth coronary function. Garlic is also a nerve stimulant and revigorating tonic that has been known for its value in cases of sexual weakness. Garlic compounds also protect cells against damage by heavy metals. 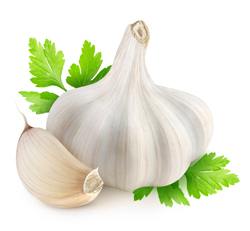 Recommended Dosage : 2 to 3 g of fresh garlic or 500 mg – 1 g of dried powder. Contraindication : Because of Garlic’s anticlotting properties, people taking anticoagulant (coumarins, salicylates, or antiplatelet drugs) should check with their doctor before taking this product. Those scheduled for surgery should inform their surgeon if they are taking Garlic supplements. During lactation excess intake may badly effect the taste of mother’s milk. Garlic should not be taken on an empty stomach, as it may cause irritation.